A week of sunshine and a huge amount of work by groundsmen saw the Readers Lincolnshire ECB Premier League programme get under way on time, with only one game falling foul of the recent bad weather. Six teams scored over 200 runs and two players hit centuries, Willl Wright of Lindum top scoring with 126 as Lindum made 258-7 at Grantham. Pierce Morley-Barnes made a welcome return to the Lincoln side, making 68 in an opening partnership of 141 with Wright who put on a further 92 for the third wicket with skipper Charlie Tomlinson before both were dismissed by James Dobson, who went to take five for 43. Grantham lost a wicket on 11 and were 65-3 when Mathew Dowman and Jack Wilson (49) began a partnership of 82. Dowman took the score to 174 and steady batting down the order brought Grantham closer to their target but the overs ran out with the score on 248. Jonny Cheer was the other century maker with 111 for Boston who reached 212 for 7. In reply, Woodhall Spa lost an early wicket but Sam Evison’s 55 and an unbeaten 74 from Prasanna Jaywardene saw them to a six wicket victory. Carl Wison’s 53 helped Bourne to 208 for 8 at Market Deeping who recovered from a shaky start in which two wickets fell for 16 runs. Josh Smith with 50 and James Hook (43) were the mainstays of the home side’s four wicket win. An opening stand of 67 between Rikki Bovey and Michael Honman provided the foundation for Alford’s innings at Bracebridge Heath which ended on 175 for 7. 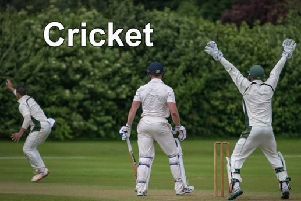 The home side made steady progress towards the total until, on 165 for four, three wickets fell with no addition to the score, including skipper Brett Houston for 63. From there, Bracebridge inched slowly to victory, new signing James Kimber hitting the winning four. Sleaford began their season with a convincing win over Louth, bowling the home side our for 111 and going on to win by nine wickets, Matthew Mountain hitting an unbeaten 51. Results: Lindum 258-7 (Wright 126, Morley-Barnes 68, Dobson 5-43), Grantham 248-8 (Dowman 56); Boston 212-7 (Cheer 111), Woodhall Spa 213-4 (Evison 55, Jayawardene 74no); Bourne 204-8 (Wilson 53), Market Deeping 205-6 (Smith 50); Alford 175-7, Bracebridge Heath 177-7 (Houston 63); Louth 111, Sleaford 112-1 (Mountain 51no); Grimsby Town v Scunthorpe Town – cancelled, waterlogged outfield.